Age may contribute to belly fat. If you're carrying extra weight around the middle, you may be looking for belly fat causes and cures. Belly fat isn't just unsightly but it is also unhealthy. The reason belly fat is considered unhealthy is because it raises your risk of heart disease. Women with a waistline greater than 34 inches and men whose waists measure bigger than 40 inches are at greatest risk. It also matters where the fat is stored. If it is located near and around your abdominal organs it is called visceral belly fat, and it poses more of a risk that the flabby (subcutaneous) fat located between your skin and abdominal wall. Poor diet and lack of exercise are primarily blamed for belly fat. However there are other factors that influence an increase in belly fat. Genetics influence how we store fat. You've probably heard that apple shaped people are more at risk for heart disease. That's because apple-shaped people store fat around the middle. Those with pear shapes tend to gain weight around the hips and thighs. How we carry our fat is often inherited. Like it or not, as we age our metabolism slows. This is most often attributed to loss of lean muscle mass over time. Lean muscle mass helps burn calories. On the flip side, many people are less active as they age and this encourages unused calories to be stored as fat. This is true for men and women, though women tend to gain even more body fat with age. 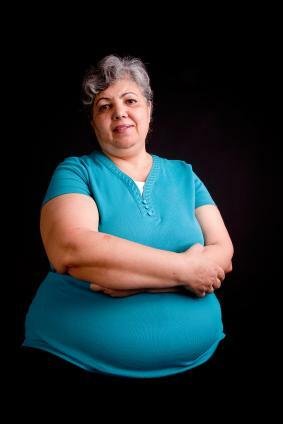 Unfortunately for women, another contributing factor to increased belly fat is menopause. With related hormonal changes that take place during this time, the distribution of body fat is likely to shift with more collecting around the middle. Some women may actually experience a wider waistline even while maintaining their normal weight. Have you ever felt like eating on a stressful day? What you may not realize is that when your body is stressed it releases a hormone called cortisol. Your liver responds to this cortisol by making more sugar. Hunger pangs tell you you're hungry and you decide you need something to eat. If you find yourself gaining weight, stress may be the culprit. While stress is a part of life, many people don't realize it can influence the size of your belly! While our bodies may be predisposed to gaining weight around the middle, it doesn't mean we have to give in and let it happen. If age may be a contributing factor to your weight gain, take time to find out how many calories you should consume for your height, age, and activity level. Some people in their 40s think they can still eat like they did when they were in their 20s. This kind of thinking leads to weight gain for most people. Due to the fact that we burn less calories as we get older means we should eat less calories if we want to maintain the same weight. If you consider each of the belly fat causes listed above, you'll see that adjusting your diet can help avert all of them. Along with reducing your caloric intake, exercise is an important element in getting rid of belly fat and keeping it off. It's the same formula that works no matter what body fat you're trying to burn. Eat less and move more! This doesn't mean starving yourself or overdoing it with exercise. It just means eating less than you do now and moving more than you do now. Take a moderate approach and you'll be happier, healthier and a little thinner.